Hotel LaRose, which opened in 1907. SANTA ROSA, Calif. — You have to love a city that pairs wineries with history-making horticulture, legendary cartoons, and African animals. Santa Rosa, the largest city in Sonoma County, has them all. A little more than an hour north of San Francisco, Santa Rosa makes for a full weekend of diverse activities — or a nice break from vineyard hopping. 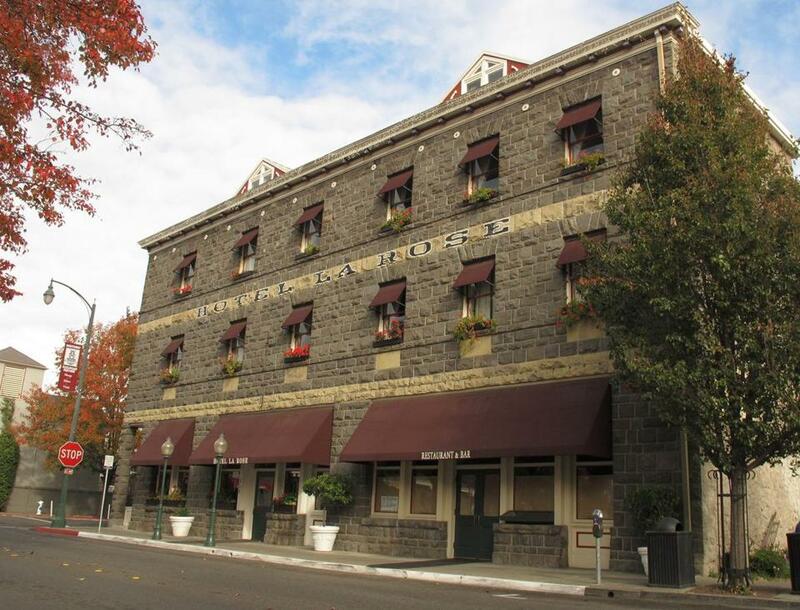 Listed with the National Trust’s Historic Hotels of America, Hotel LaRose (308 Wilson St., 707-579-3200, hotellarose.com), located in historic Railroad Square, evokes a turn-of-the-last-century feeling. The pink stone exterior is complemented by mauve ceilings and rich dark woodwork in the lobby. Built by four Italian stone masons, the hotel first opened in 1907. Another distinctive city lodging is the Flamingo Conference Resort and Spa (2777 Fourth St., 707-545-8530, flamingoresort.com), designed in 1957 to mimic the original Las Vegas Flamingo. Its iconic tower is a Santa Rosa landmark. Nicely landscaped grounds surround a serene outdoor pool. In the lounge, there’s live music on weekends and salsa dancing on Sunday nights. 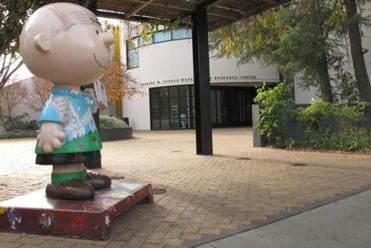 The Charles M. Schulz Museum and Research Center. The Russian River Brewing Company Brewpub (725 Fourth St., 707-545-2337, russianriverbrewing.com) is the place to sample local brews like Pliny the Elder, a double IPA that has such a cult following the shop limits the number of bottles you can buy at one time. On the food side, we loved the pizza, which comes in three sizes and is topped with everything from pepperoni to pine nuts; mine included walnuts, caramelized onions, gorgonzola, and pears. Salads and sandwiches are also creative and filling. If whisky is your beverage of choice, visit Jack & Tony’s (115 Fourth St., 707-526-4347, jackandtonys.com), which offers more than 400 whiskies, along with Sonoma County wines and local microbrew beers. The kitchen serves traditional American fare from bar snacks to sandwiches to entrees, and menus change seasonally. Metallic sculptures, art glass lamps, and vibrant colors give Jackson’s Bar and Oven (135 Fourth St., 707-545-6900, jacksonsbarandoven.com) a funky, modern feel. Diners have a view of the open kitchen and wood-fired oven, which is used not only for pizza but also for chicken, mussels, breads, and even Brussels sprouts, according to chef owner Josh Silvers. Chevy’s (24 Fourth St., 707-571-1082, chevys.com) has been operating in the sprawling 1927 freight train depot for 26 years. Diners can enjoy Tex-Mex fare and several varieties of tequila to the sound of mariachi music. Everything is made from scratch. “There are no cans in our kitchen,” said Kevin Foulke, general manager. Urban tasting rooms bring the area’s best-known crop into the city. At Trecini (684 Seventh St., 707-525-9400, trecini.com) John Vicini, a native of Italy; his wife, Cathy; and their son, David pour their own pinot noir and sauvignon blanc, along with merlot and zinfandel (the name Trecini was chosen to represent “three Vicinis”). Trecini also makes a limited batch of olive oil each year. Ancient Oak Cellars (621 Fourth St., 707-536-1546, ancientoakcellars.com) is a tasting room and deli that features the work of local artists. It offers a wide variety of wines as well as sparkling mead and cider. 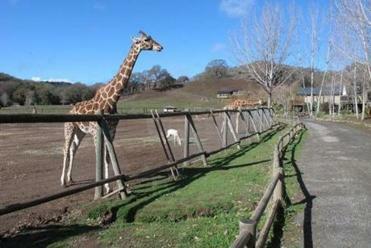 Safari West, a 400-acre African wildlife preserve. Stroll historic Railroad Square (railroadsquare.net), also known as Santa Rosa’s Old Town. The area is listed on the National Register of Historic Places for its preservation and restoration of several structures rebuilt after the 1906 San Francisco earthquake. At the visitors welcome center in the restored stone train depot, you can pick up maps and get tips from the friendly people who work there. The area is home to a wide variety of antiques and specialty shops, including our all-time favorite store name, “Disguise the Limit,” above the entrance to a costume boutique. When renowned horticulturalist Luther Burbank, who began his career in Lancaster, Mass., was asked “What is the best thing to raise in Massachusetts?” he replied, “Money to go to California.” Luther Burbank Home & Gardens (204 Santa Rosa Ave., 707-524-5445, lutherburbank.org) celebrates the man who brought us Shasta daisies, russet potatoes, elephant garlic, and pluots. The gardens, which include a large display of roses, are open daily year round. From April to October visitors can tour the house and greenhouse. Charlie Brown’s kite is still stuck in a tree in the courtyard of the Charles M. Schulz Museum and Research Center (2301 Hardies Lane, 707-579-4452, schulzmuseum.org). Schulz, the creator of the Peanuts cartoons, lived and worked in Santa Rosa for 30 years until his death in 2000. We enjoyed seeing his re-created studio with his desk and the drawing board he used throughout his career, and we were fascinated by the Peanuts Tile Mural, which features an image of Lucy holding the football for Charlie Brown composed of 3,588 Peanuts comic strip images printed on individual 2- by 8-inch ceramic tiles. Safari West (3115 Porter Creek Road, 707-579-2551, safariwest.com) is a 400-acre working ranch and African wildlife preserve with some 800 animals, including endangered species such as the addax, dama gazelle, and black-and-white ruffed lemur. Guests can take a day safari (by reservation only) or stay overnight in upscale tents with en suite bathrooms and decks. On our visit, we oohed and aahed over baby giraffes and laughed at the antics of ring-tailed lemurs all but camouflaged among the trees.